Home Explore Gather Your Girls for Cranfest! Gather Your Girls for Cranfest! 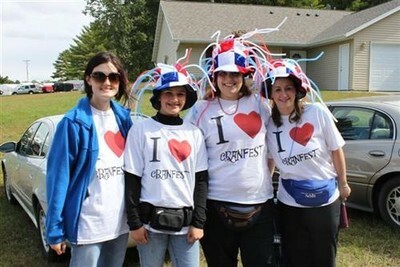 Last fall, when I was talking to my daycare provider, she mentioned a festival that her girlfriends had attended and it remained etched in my memory—the Warrens Cranberry Festival in Warrens, Wis., simply referred to as “Cranfest” to those in the know. Well, in addition to cranberries, the event features over three miles of shopping—it’s one of Wisconsin’s largest craft shows. There are over 1,300 booths, including arts and crafts (unique handmade jewelry! Cute knitted booties for that new baby in your life! Creative garden art! ), antiques, fishing and hunting supplies, clothing, purses, sports memorabilia, and over 100 booths of fresh farm produce. Basically, if you like craft shows, flea markets, or farmers’ markets, you will love Cranfest. There’s also a large parade featuring a number of talented marching bands (and the Warrens Cranberry Festival Royalty), 10 contests (ranging from “Biggest Cranberry” to “Best Original Recipe”), guided tours of an active cranberry marsh, and lots and lots of great food. Bonus: Event organizers are even putting together a flash mob in honor of this year’s 40th celebration. I mean, come on. Who doesn’t love a well-executed flash mob? I saw one once while going into work in downtown Minneapolis. So cool. Warrens, Wis. is about a 2.5-hour drive from the Twin Cities metro. It’s close enough that this festival can easily double as a girls’ getaway weekend. Spend a day at Cranfest and the rest of the time exploring the area. Check out the state’s largest Amish community in Cashton, or sample local wine at Fawn Creek Winery in Wisconsin Dells or Wollersheim Winery in Prairie du Sac, near Sauk City. Sounds like a great weekend to me! Avoid traffic by taking a shuttle bus. The Festival offers free shuttle service from Birkholz Field, Jellystone Park, and McMullen Campground. The shuttles run all three days from 8 a.m. to 5 p.m. If you’re staying in nearby Tomah, ride the Tomah Chamber of Commerce Festival Shuttle. Cranberry Marsh Tours take place Friday and Saturday of the Festival. Ticket sales start at 7 a.m. each day, and tours run every 15 minutes from 8 a.m. to 3 p.m. both days. Make sure to get your tickets early! The tours often sell out by noon and tickets are only sold at the Wetherby Stone Building, where the tours begin. You can’t make reservations in advance. Tickets are $6 per person.